Stanley Yelnat's family has a history of bad luck, so he isn't too surprised when a miscarriage of justice sends him to a boys' juvenile detention center, Camp Green Lake. There is no lake - it has been dry for over a hundred years - and it's hardly a camp. As punishment, the boys must each dig a hole a day, five feet deep, five feet across, in the hard earth of the dried-up lake bed. The warden claims that this pointless labor builds character, but she is really using the boys to dig for loot buried by the Wild West outlaw Kissin' Kate Barlow. The story of Kissin' Kate, and of a curse put on Stanley's great-great-grandfather by a one-legged gypsy, weaves a narrative puzzle that tangles and untangles, until it becomes clear that the hand of fate has been at work in the lives of the characters - and their forebears - for generations. With this wonderfully inventive, compelling novel that is both serious and funny, Louis Sachar has written his best book to date. 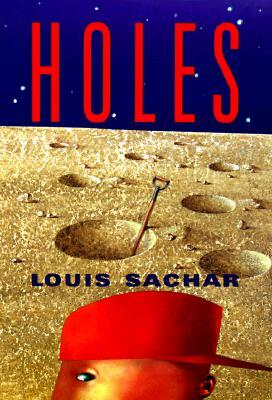 Holes is a 1998 New York Times Book Review Notable Children's Book of the Year and the winner of the 1998 National Book Award for Young People's Literature, the 1999 Boston Globe - Horn Book Award for Fiction and the 1999 Newbery Medal.